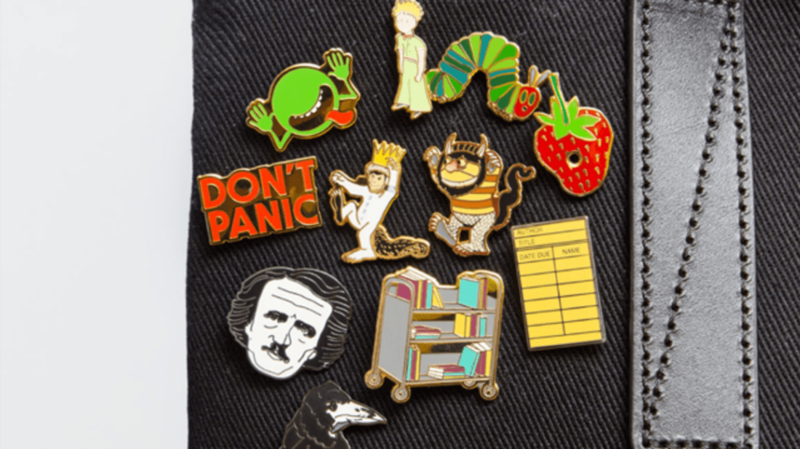 Clothing company Out of Print, known for celebrating beloved books, is giving fans another way to reference their favorite titles with new matching pin sets based on popular books. The theme includes Edgar Allan Poe's "The Raven," Maurice Sendak's Where the Wild Things Are, Eric Carle's The Very Hungry Caterpillar, Douglas Adams's The Hitchhiker's Guide to the Galaxy, and Antoine de Saint-Exupéry's The Little Prince. The store is also offering a set that features a book cart and the quote "this is how we roll." Each of the literary pairs cost $18 on Amazon. In an effort to spread their love of literature, some of their profits fund literacy programs and book donations. Take a look at a few of the enamel pins below.